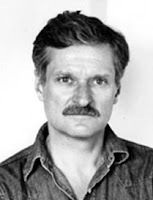 Rare it is that John Ashbery explains one of his poems. But, in a radio interview in 1966, he did that just. He read "These Lacustrine Cities" and then went line by line offering various sorts of explanations - paraphrase, sources for phrases and words, a sense of the process of composition. Now we have released a PennSound podcast, #18 in our series, featuring this recording, which aired on WKCR. The podcast is 18 minutes long.